Isn't Xperia SL is a refresh model of Xperia S? Yes, Sony released earlier this year the smart phone with almost exact features and specifications except for two things - Android 4.0 operating system and little faster CPU. Let us find out what is in and what is out in this near carbon copy of the old one. Before that, it is to be noted that build wise the two phones are same. Both are plasticky but manage to give sturdy feel. They lack rounded edges and slim profile. Due to this the two looks a bit blocky. The two are fat but light weight. The form factors of both the phones are like Candy bar. 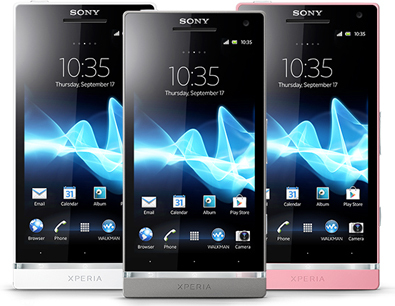 Sony Xperia SL is 5.04 x 2.52 x 0.42 inches (128 x 64 x 10.6 mm) in dimensions and Sony Xperia S is 5.04 x 2.52 x 0.42 inches (128 x 64 x 10.6 mm). Both the phones weigh the same - 5.08 oz (144g). The display of both the phones are same - 4.30 inches, and so the resolutions as well as pixel density - 720 x 1280 pixels and 342 ppi respectively. Both sport TFT capacitive multi-touch screens. The Xperia SL came with Android 4.0.4 but the Xperia S initially was running on Android 2.3.5. Later Sony rolled out Android 2.3.7 and then Android 4.0.4 OS for it. Both the phones will be upgraded to Android 4.1 Jellybean in Q1 2013. The battery backup of Sony Xperia SL is better than Sony Xperia S. The former gives a talk time of 8.25 hours and later about 7.50 hours. 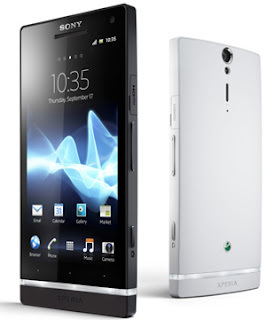 Sony also claims stand-by time of 17.1 days in its Xperia SL and 18.8 days in Xperia S.
Sony has powered its Xperia SL with dual core 1700 MHz processor and has equipped the Xperia S with dual core 1500 MHz processor. Both have Adreno 220 graphics processor. Both are powered by 1024 MB of RAM. Built-in storage of both Xperia SL and Xperia S is 32GB. Both the phones are equipped with 12.1-megapixel rear cameras and LED flash. The front cameras too are of same pixels quality - 1.3-megapixel. The video recordings of the two are 1920 x 1080 (1080p) and 29fps. The other common camera features are Back-illuminated sensor (BSI), Auto focus, Touch to focus, Digital image stabilization, Face detection, Panorama and Scenes. Sony has equipped the two phones with Bluetooth 2.1, Wi-Fi 802.11 b,g, n with hotspot, 3.5mm audio socket, HDMI, microsUSB, NFC, DLNA, Tethering, OTA sync and Computer sync. The Xperia SL has A-GPS and the Xperia S got GPS and Glonass. While the Xperia SL is selling for around Rs 25k, Xperia S is now found to be sold around Rs 24k. The price difference is very marginal and can’t be considered as a deciding factor here. Both the phones are good for all the Sony fans as there are plenty of equalizer settings as well as special audio enhancements. I personally found 'Studio' preset very effective for most genres of music. The Xperia SL is to be more preferred due to its speed bump. This is a guest post provided by Sanjay Kumar Negi, works at 91Mobiles.com. This site offers price and specification details on mobile phones, tablets and accessories in India such as Sony Xperia SL.